In the words of Eagles owner Jeff Lurie, “This is an exciting day for the Philadelphia Eagles Franchise.” The page has been turned in the Andy Reid era and has been officially flipped over to the Chip Kelly chapter. We, in Philadelphia, have been clamouring for this moment over the last couple of years. Along with every, “Times yours” and “I’ve gotta do a better job,” there was a growing optimism that this was, indeed, Andy’s last ride. The fans were ready to embrace a new personality, and today they got their chance. Chip Kelly walked into the Nova Care Complex looking around at all the tradition, cameras, and media, knowing he would have to convince everyone he was committed. This was exactly what he accomplished, even referencing Cortez, saying “I’ve burned the boats.” Without the help of flash cards or teleprompters, which were used by Marc Trestman (new HC of Chicago Bears) in his news conference, Chip Kelly took the many questions he was asked and gave a quick, well explained and knowledgable answer. He was undaunted and relaxed, which speaks volumes when coming from the collegiate level. The NFL is filled with scrutiny and skepticism, two values that can bury an unsure and wavered personality. However, the only thing that was buried today, was the misconceived notion that Joe Banner and the Browns ever had a chance at landing the lead duck of Oregon. There was a sense of familiarity in his voice when he spoke of relationships he already has developed in the NFL. He said, “Football is Football” and “Football is a personnel driven operation,” when asked the question of if his system would succeed at the professional level. I get the sense that this guy is hungry and will be determined to make any adjustments necessary to be a winner. To be honest with myself and the public, I cannot sit here and definitively say whether or not this will be a success. All we can do, as fans, is make our judgements based on what was portrayed to us today and in the future. 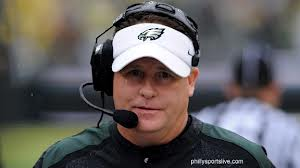 As for today, if this press conference is a preview of the way Chip Kelly pans out in Philadelphia, I must say I am sold on the fact that he will succeed in making this franchise relevant again on a national level. Previous Previous post: The Saga Ends……..